Statistics site obesity in the US at around 33% of the population. Something for Everybody AND EVERY BODY! SEATING WITH DIGNITY. Fortunately, there are more and more bariatric options available from contract furniture providers. Bariatric furniture includes a wide variety of wood, metal and upholstered seating pieces that are designed and tested to hold up to heavier weights then standard furniture pieces. Adding bariatric furniture to a seating space is not only a necessary option to prevent furniture breakage, but all people deserve the opportunity to use seating with an appropriate width that allows a body fit comfortably. Truth is that although bariatric seating serves a very practical purpose, constructing furniture to higher weight standards also serves to ensure a highly durable and versatile seating piece that can and will be used by everyone (patients, clients, guests and staff!) regardless of size. 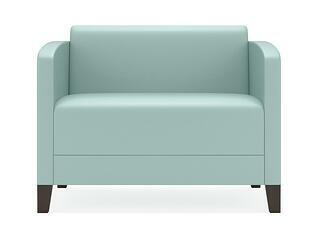 So what exactly does bariatric furniture mean? Although there may be some variations, in general a bariatric seating piece has a seat width of at least 30 inches and sometimes even up to a spacious 40 inches. In contrast, a standard lobby or common area chair is usually about 20 inches. Additionally, a bariatric chair is weight tested by professional trade and industry organizations such as ANSI / BIFMA whose certifications are recognized nationally. Bariatric chair weight standard certifications range from 750lb to 1000 lb. A great tool for common areas and lobbies is to combine both standard and bariatric pieces seamlessly using ganging systems that combines individual pieces into a cohesive group. Seating units and table units join together to create a seating area that comfortably accommodates people of all shapes and sizes. Many contemporary style seating groups that include bariatric units have sleek styling that includes metal and wood frames with your choice of upholstery. As with any furniture purchase for any healthcare or group living facility, contact a reputable contract furniture supplier for the right advice for seating pieces, configurations and upholstery.